During the 41st Session of the IPCC that took place in Nairobi, Kenya, in February 2015, the Panel called for a meeting where experts, IPCC focal points and other IPCC representatives could share experiences, best practices and lessons learnt from the communication and outreach activities of the Fifth Assessment Report (AR5) to inform the communication of the Sixth Assessment Report (AR6). IPCC Communications: Experiences from the AR5 by Chris Field et al. Communicating the science of climate change mitigation: AR5 experiences from Working Group III by Youba Sokona et al. Linguistic analysis of IPCC summaries for policymakers and associated coverage by Suraje Dessai et al. Exploring trans-disciplinary approaches to communicating the IPCC Assessment Reports by Jessica Dator-Bercilla et al. Seven recommendations for improving IPCC communication and policy impact by Asuncion St.Clair et al. These are examples of outreach products that use IPCC findings as a basis of their information but are not prepared by the IPCC. Display of this material on our website does not imply IPCC endorsement or approval of the products or the conclusions they contain. None of them has been subjected to IPCC review. A number of expert meetings and workshops have been held to support the process of preparing the Fifth Assessment Report. For more information, please see Concept Notes for Cross-Cutting Issues and Planned AR5 Workshops and Expert Meetings in the AR5 Reference Document. Also see IPCC-XXXI/Doc. 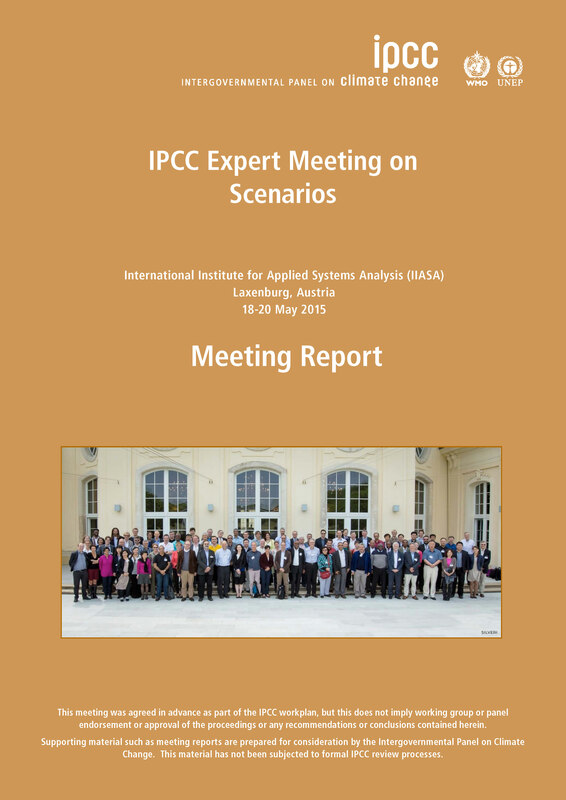 10 "Scoping of the IPCC 5th Assessment Report - Expert Meetings and Workshops". 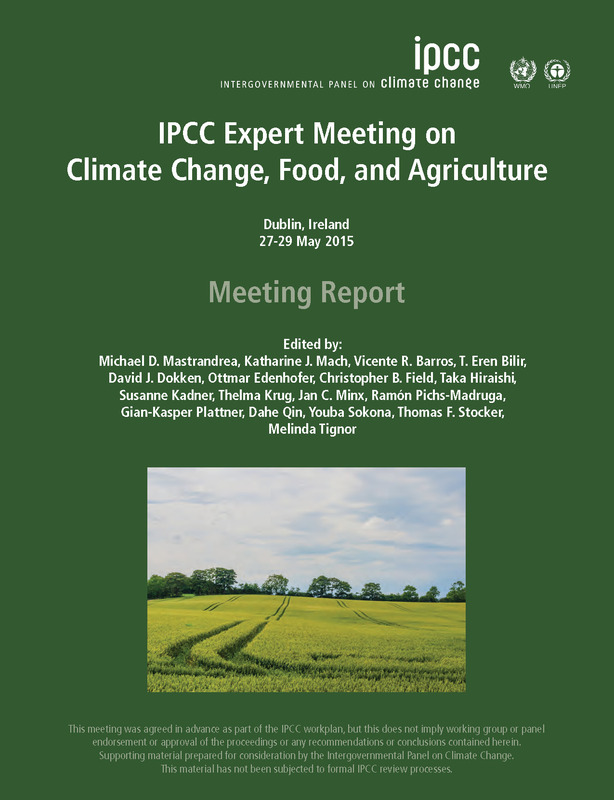 This report includes a concise Information Paper that provides recommendations to the IPCC for the Sixth Assessment Cycle, in particular to the leadership of Working Groups I and II. This Report also contains summaries of the discussions in the plenary sessions and in the breakout groups. It further includes the abstracts of the keynote and perspective presentations as well as the poster abstracts presented during the Workshop. The meeting brought together 110 experts from 52 countries to discuss regional climate projections and their use in impacts and risk analysis studies. The workshop included experts from the Working Group I and Working Group II communities, including scientists from the climate modelling community, the regional modelling and downscaling community, and the climate impacts and risk analysis communities. This report considers assessment across the IPCC Fifth Assessment Report (AR5), as well as the most compelling new research since the publication of the AR5. Participants drawn from around the world discussed options for future IPCC work. The Expert Meeting consisted of a combination of presentations and discussion sessions. The meeting addressed food production and food security in a changing climate, including climate change risks for food production and interactions with mitigation, adaptation, and development. Land-use trends and non-production aspects of food security, including future demand for food and post-harvest components of food systems were examined. The meeting also examined policy responses, including mitigation and adaptation options with the potential to enhance food security or create competition for land and water. The Republic of Ireland generously hosted the meeting in Dublin. This expert meeting report provides a concise summary of the major recommendations coming from the meeting. A first draft of these recommendations had been brought to the attention of the Panel already at its 42nd session.1 The report body extends on these recommendations and provides the necessary background required for an appreciation of the discussions that have been taking place at the meeting. The Annex further provides summaries of the individual talks given as well as breakout group discussions. The meeting brought together 91 experts from 29 countries. After conclusion of the IPCC’s fifth assessment cycle, it provided an opportunity for the research community and the IPCC to jointly reflect on the new scenario process as well as the use of scenarios in AR5 and how it can be further improved to allow for a more integrated assessment of mitigation, adaptation, climate change impacts and broader sustainable development across the entirety of IPCC work in the future. 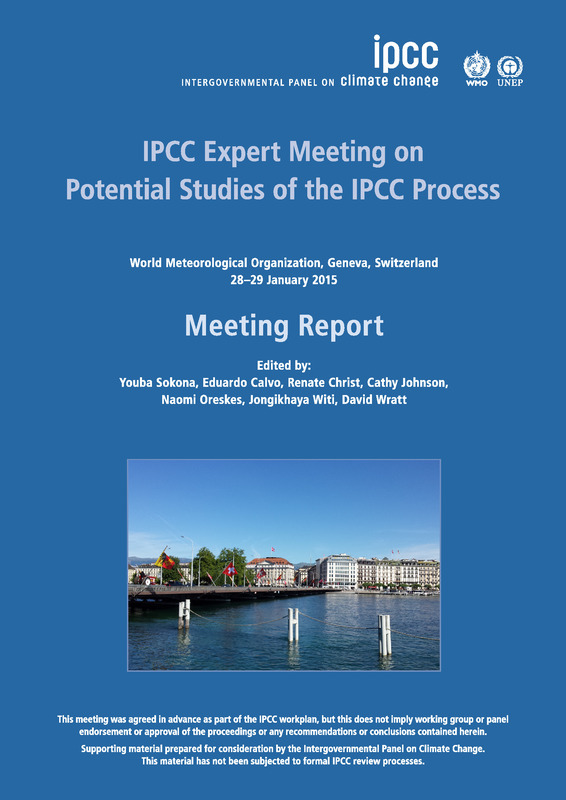 This report summarizes discussions of the Expert Meeting on Potential Studies of the IPCC Process. At its core is a set of recommendations and main outcomes of the meeting. It also contains summaries of meeting discussions of potential studies, as well as abstracts for the meeting's key note presentations. The Intergovernmental Panel on Climate Change approved the "Principles to guide the IPCC's engagement in potential studies of the IPCC process" as recommended by the Expert Meeting on Potential Studies of the IPCC Process (28-29 January 2015, Geneva, Switzerland) and contained in Annex 1 to this Decision. The meeting explored in-depth issues related to human settlements and climate change. As cities and infrastructures are at the forefront of climate change, the role of urban planning becomes key for adapting to it and implementing mitigation strategies. The aim of the workshop was to address this topic and fill the gaps of the AR4 as part of the preparation of AR5. The workshop explored how the Global Earth Observation System of Systems (GEOSS) could serve the data and information needs of the research communities dealing with climate impacts and adaptation, exploring its potential to improve and accelerate their access to a broad range of relevant information. The workshop results will be able to drive the implementation of GEOSS over the next several years in a way that contributes in a concrete and practical manner to the research process for the AR5 and other future assessments. The workshop was organized by Working Groups III and II of the Intergovernmental Panel on Climate Change (IPCC) to facilitate the further development of scenarios by the scientific community. The objective of the workshop is to develop a framework of socioeconomic scenarios to be used by the different scientific communities working on climate change impacts and on options for adaptation to and mitigation of climate change. Consistent treatment and communication of uncertainty across the Working Groups is a key cross-cutting issue for the IPCC and goal for the AR5. To address this important issue, the Co-Chairs of the three Working Groups convened a small meeting on Consistent Treatment of Uncertainties, 6-7 July 2010 at the Jasper Ridge Biological Preserve in Stanford, CA, USA. The outcome of the meeting was a decision to produce updated Guidance Note for AR5, with the goal of improving the distinction and transition between different metrics and their consistent application across the Working Groups in the AR5. The "Guidance Note for Lead Authors of the IPCC Fifth Assessment Report on Consistent Treatment of Uncertainties" presents an approach for the treatment of uncertainty and the communication of key findings of the AR5 that can be applied consistently in each Working Group. At its 32nd session, the IPCC Panel urged the implementation of this Guidance Note. Guidance Note for Lead Authors of the IPCC Fifth Assessment Report on Consistent Treatment of Uncertainties Mastrandrea, M.D., C.B. Field, T.F. Stocker, O. Edenhofer, K.L. Ebi, D.J. Frame, H. Held, E. Kriegler, K.J. Mach, P.R. Matschoss, G. Plattner, G.W. Yohe, and F.W. Zwiers. The purpose of this Workshop was to bring together the leading world experts on all issues related to sea level rise, including the field of ice sheet dynamics and ice sheet instabilities, in order to accelerate scientific research that will feed results into the AR5. This expert meeting provided tentative best practices in selecting and combining results from multiple models for IPCC AR5; in short the beginning of a quantitative framework for analysis and assessment of the models. The meeting will help to bring the community into a position to make better use of the new model results and provide more robust and reliable projections of future climate, along with improved estimates of uncertainty. Improving technical aspects of detection and attribution, especially harmonizing terms and definitions, is an important goal to advance this topic, with emphasis on impact-relevant changes in the climate system and impacts in natural and human systems. The expert meeting has covered the full set of fundamental detection and attribution issues, including techniques, interpretation and specific examples that are relevant to changes in climate and impacts for the Fifth Assessment Report (AR5). The scoping meeting in Venice was convened to prepare a scoping paper describing the objectives and annotated outline of the AR5 and its Working Group contributions, and to prepare a broad outline for the Synthesis Report. The draft scoping paper is at present circulated for comments to governments and will then be submitted for consideration and approval to the Sessions of the three IPCC Working Groups and the 31st Session of the IPCC, scheduled to be held from 26-29 October 2009 in Bali, Indonesia. At its 38th Session (Geneva, November 2008), the IPCC Bureau decided to task a small Steering Group, chaired by Thomas Stocker (Co-Chair of WGI), to convene an Expert Meeting on the Science of Alternative Metrics with the goal to review the basis of current scientific research on this topic, in particular to assess the status of knowledge on GWPs and Global Temperature Potentials (GTPs) and other more elaborate metrics, as well as any other recent developments since the AR4 to calculate CO2 equivalence, including the timescales at which possible metrics can be applicable. For reports and other documentation related to all IPCC Expert Meetings and Workshops, please see Workshops and Expert Meetings or the relevant Working Group website. For the period of the AR5, the IPCC decided that new emission scenarios should be developed by the scientific community. Further information can be found in the Progress Report submitted to the 32nd Session of the Panel (IPCC-XXXII/Doc. 16) and to the 33rd Session of the Panel (IPCC-XXXIII/Doc. 4). To further facilitate the integration of a new generation of socioeconomic scenarios by the scientific community for climate change impacts, adaptation and mitigation research into the 5th Assessment Report, expert meetings on scenarios are also held back-to-back with IPCC Lead Author meetings. For information, a list of relevant meetings is listed below. The Task Force on National Greenhouse Gas Inventories (TFI) was established by the IPCC to oversee the IPCC National Greenhouse Gas Inventories Programme (IPCC-NGGIP). The core activity is to develop and refine an internationally-agreed methodology and software for the calculation and reporting of national GHG emissions and removals and to encourage its use by countries participating in the IPCC and by parties of the United Nations Framework Convention on Climate Change (UNFCCC). The NGGIP also established and maintains an Emission Factor Database. For a full list of TFI Workshops and Expert Meetings and relevant documents for previous meetings (meeting reports, Co-Chairs summaries, etc.) please see the TFI meeting calendar. To support preparations for the IPCC's two Special Reports released in 2011, a few scoping and expert meetings have been held. Note that a new practice at the IPCC is the back-to-back holding of an expert meeting on scenarios with lead author meetings, to ensure coordination with the scientific community which is developing a new generation of socioeconomic scenarios for climate change impacts, adaptation and mitigation research. Further information can be found in the Progress Report submitted to the 32nd Session of the Panel (IPCC-XXXII/Doc. 16) and to the 33rd Session of the Panel (IPCC-XXXIII/Doc. 4). To support the preparations of the Fourth Assessment Report (AR4), a number of workshops and expert meetings were held. Some addressed cross cutting themes (CCT) that were identified in order to ensure a better treatment and coordination of matters that are dealt with in more than one Working Group. Other AR4 workshops and expert meetings addressed Working Group's specific issues and other matters. 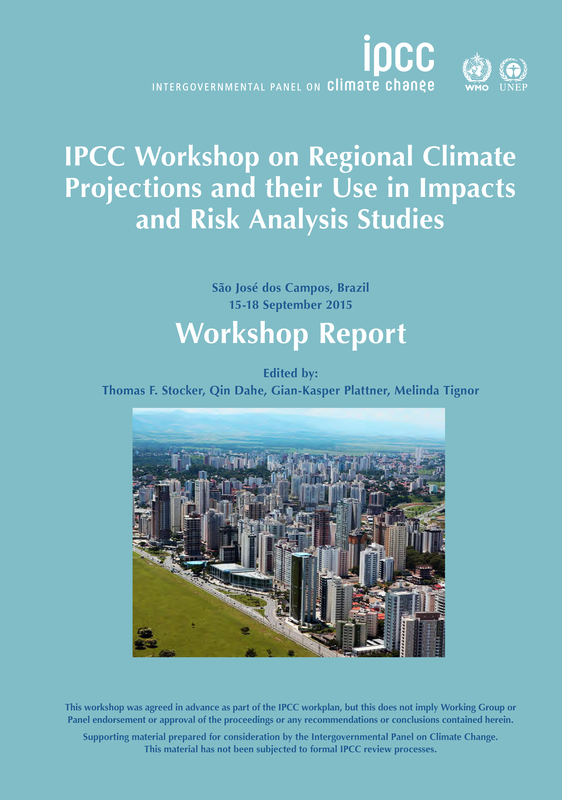 A list of proceedings and reports of all IPCC workshops can be found under “ IPCC Reports - Supporting material”.